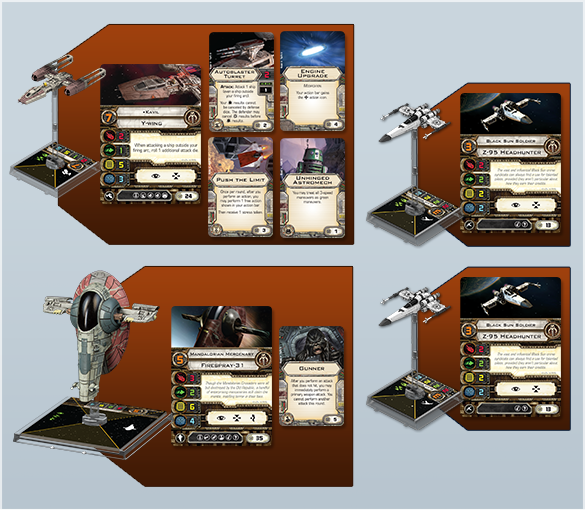 As we look forward to the introduction of the new Scum and Villainy faction, we X-Wing players face an unusual situation. 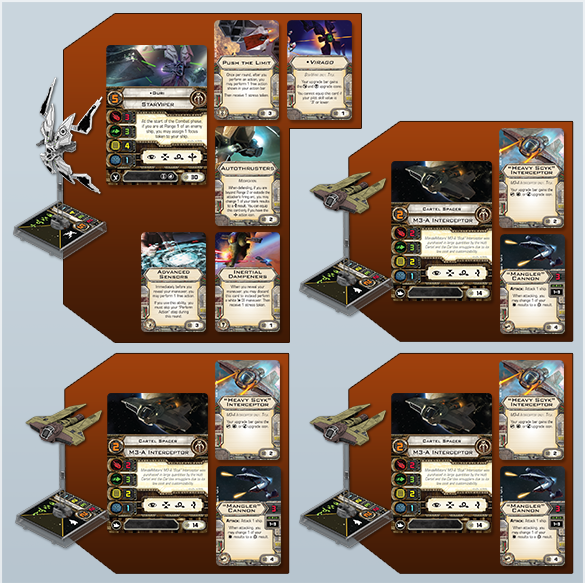 The sheer number of pilots and upgrades presents a dizzying array of options, and it’s hard to know where to start building squads for the new metagame. 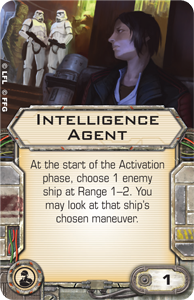 This article will explain some of what I expect we’ll see as popular archetypes as the new ships are released. 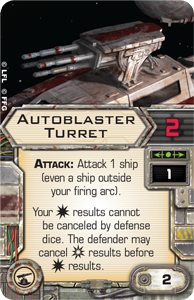 Turrets: Turret ships tend to be durable and can always keep fire on a target. 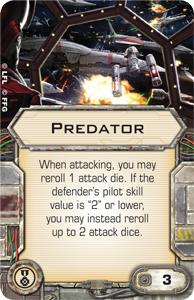 They also tend to be expensive compared to other ships that have the same number of attack dice. They prey on arc-dodgers. 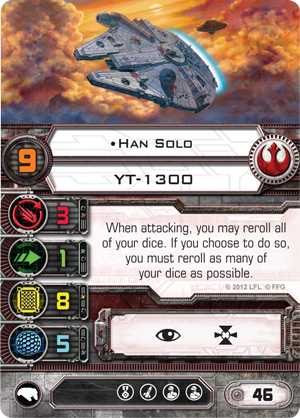 Han Solo , Dash Rendar , and the VT-49 Decimator pilots are popular. Jousters: Joust ships all sport the best durability-to-cost or attack-to-cost ratios in the game. 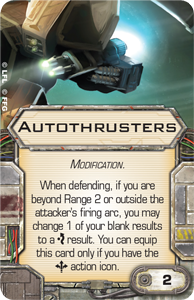 Almost always, they are flown by non-unique pilots that you point at the opposing side and fire. They don’t have many tricks, but it’s hard to beat them point-for-point for health, agility, or red dice. They tend to beat turrets. This pillar is dominated by TIE fighters, Z-95 Headhunters, and B-wings. 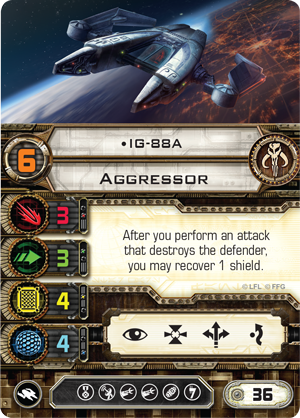 Arc-dodgers: Arc-dodgers cost more than the jousters, and will crumble under focused fire. However, they excel at avoid jousting ships’ firing arcs and can chew up most jousters over a number of turns. They almost always have some sort of nonstandard movement available to them, such as decloak, boost, or barrel rolls. The TIE phantom is this pillar’s current ruler. A 360-degree view of the TIE phantom, arc-dodger extraordinaire. Few lists are composed solely of ships belonging all to the same pillar. Usually, the best lists balance synergies between mixed ship types. My World Championship list had a turret backed up by a few jousters, for example. The list I beat in the finals was an arc-dodger with a strong jousting component. 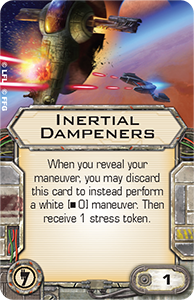 Most lists that you see in high-end tournament play feature only the best ships from these three categories, with other ships that don’t fit in falling behind. 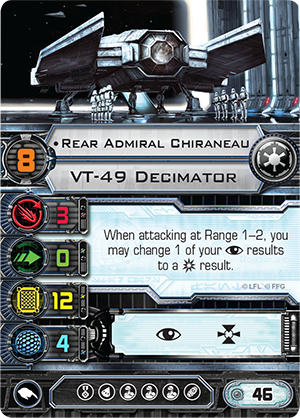 Wave V increased the power of turret ships, as the YT-2400 and VT-49 Decimator arrived on the scene. In the current metagame, arc-dodging has gotten more difficult. You can also find more two-ship builds than ever before, as the new ships have a hefty point cost associated with them. 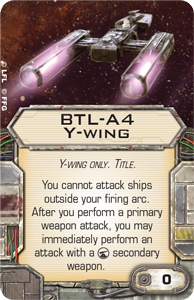 We can begin our exploration of how the X-Wing metagame might change by asking the question: how will the new upgrades from Wave VI fit into the current metagame? For the most part, they won’t fit into the current power builds. 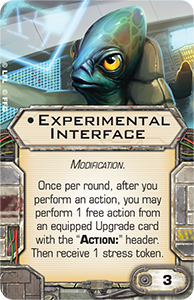 Few of the upgrades are playable outside of the Scum faction, but these few will still make a splash. 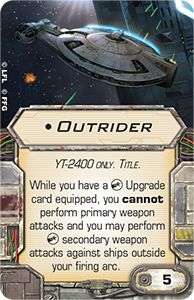 Rather than further elevating the current power builds, these upgrades will lend greater strength to squads that have recently taken a hit. The first of these upgrades is Autothrusters . 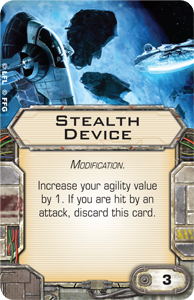 I imagine that every TIE interceptor and A-wing will be equipped with these, and I expect these ships to see more play. 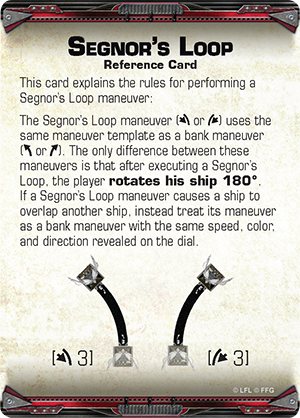 These arc-dodging ships will survive longer against, and inflict more damage upon, the turrets that prey on them. 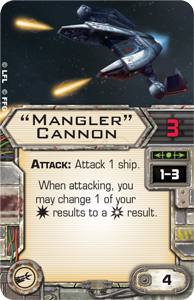 The next is the Mangler Cannon , which will be used by the Outrider to remove the “donut hole” that their Heavy Laser Cannons gave them. 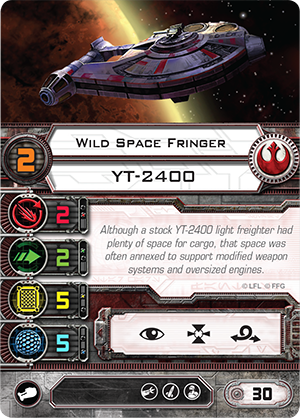 At thirty-nine points, a Wild Space Fringer with Outrider and a Mangler Cannon is the cheapest three-attack, Range 1–3 turret you can find. 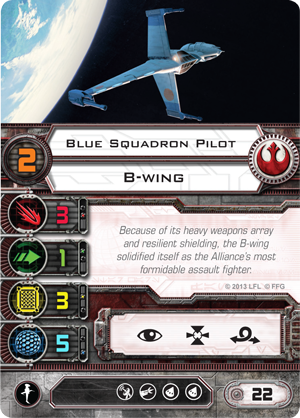 For the jousting ships, the Y-wing might make a comeback. 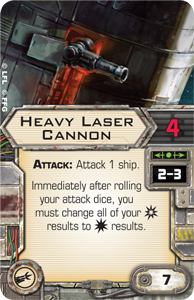 It was seen in Rebel swarms as a durable cheap ship, but it has fallen out of favor. 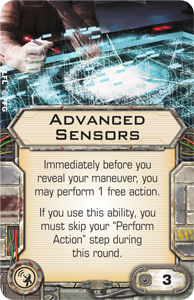 With the new BTL-A4 Title, you can add an ion shot to the standard attack at a reasonable price. 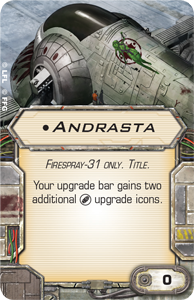 So each pillar gets at least one new card to add to their ships, but none of them add to the most popular ship in the category. This is great because it adds more options to your Rebel and Imperial lists, and more variety in each round of an event. And that’s before even considering the Scum cards! The Scum faction is great at tailoring a ship for the role you want it to play. 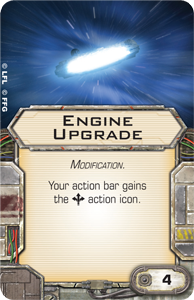 They have more upgrade slots, and their illicit and Salvaged Astromech slots are unique to their ships. As such, it’s very hard to place them into neat categories, which fits the faction’s style. 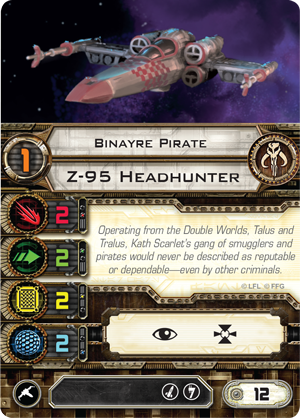 For example, look at a Binayre Pirate with a "Hot Shot" Blaster ; it’s a jouster that can double as a turret for a round. 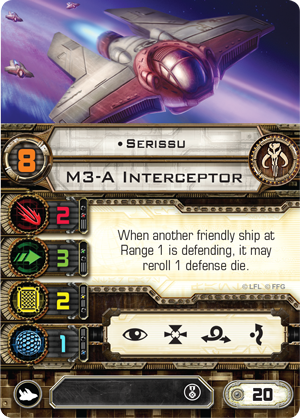 Serissu with Elusiveness and a Stealth Device combines well with five Binayre Pirates with “Hot Shot” Blasters. 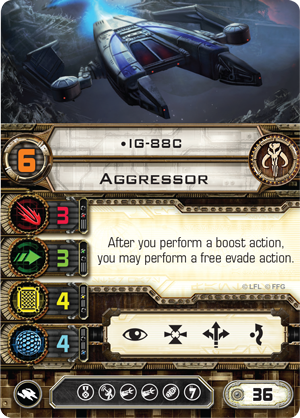 This squad has less aggression than a typical swarm, but it forces your opponents into hard choices. 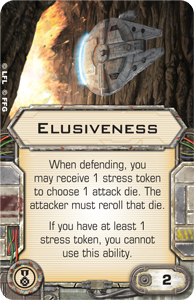 Will they fire at the four-agility Elusive M3-A interceptor at long range, or will they slowly fight through your defensive rerolls to take down the more threatening ships? 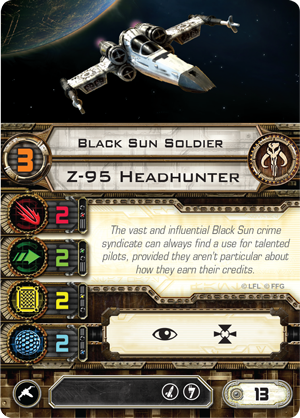 Likewise, I think a lot of the first Scum lists are going to be one or two named ships, with a contingent of smaller ships such as Z-95 Headhunters or M3-A interceptors to back them up. It’s a solid start to try out the faction, as you can see what your anchor ships can do, while using the accompanying rabble to add more health and damage. 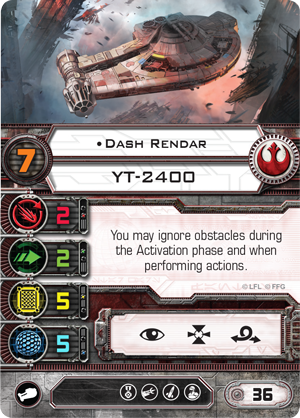 Still, the faction can’t really support the brute force squads like the TIE swarm or the Rebel swarm of four B-wings and one Z-95 Headhunter. The Scum need to use their unique tricks. The anchor ship can vary based on what you want to do with it. 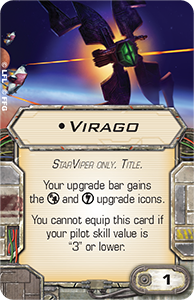 The StarViper, preferably with Virago and Advanced Sensors , can end up just about anywhere. 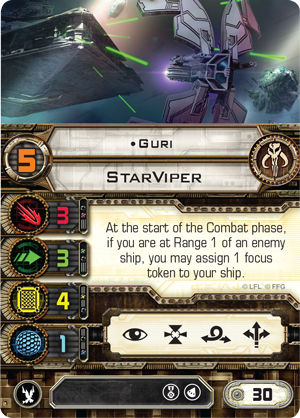 Guri , loaded down with Push the Limit , Virago, Autothrusters, Advanced Sensors, and Inertial Dampeners , is extremely hard to pin down. 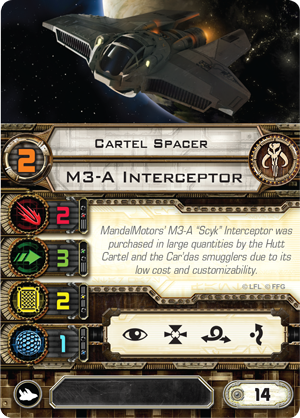 You can then support this arc-dodger with such allies as three Cartel Spacers with "Heavy Scyk" Interceptor Titles and Mangler Cannons. 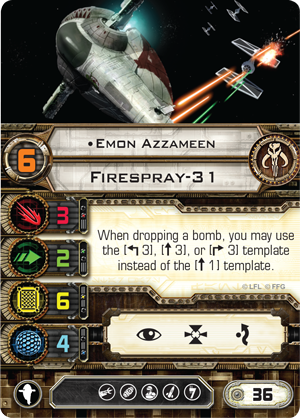 The Firespray-31 also works great as an anchor ship. 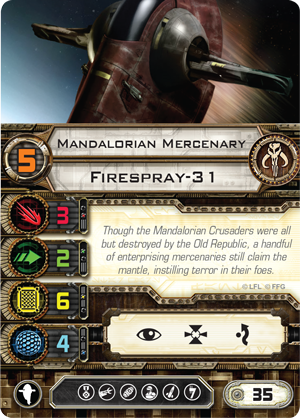 All of the new pilots are good at what they do, and one loaded Firespray-31 plus a few Headhunters is a solid build. 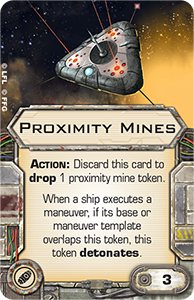 With an Illicit slot added to its already impressive array of upgrades, this ship can easily fulfill many different roles. 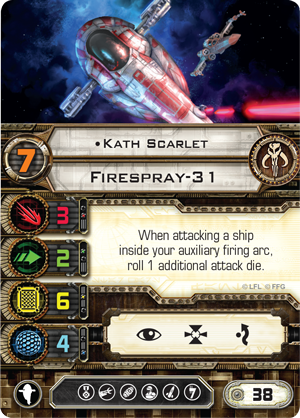 Kath Scarlet loaded with an Engine Upgrade , Push the Limit, and K4 Security Droid flies a lot differently than Emon Azzameen with Experimental Interface , the Andrasta Title and three Proximity Mines ! The Aggressor is almost never going to be seen as a lone anchor ship. 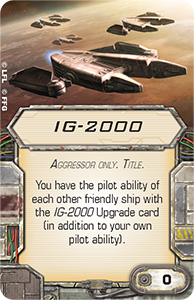 This ship works best in pairs, each with the IG-2000 Title. Or, in epic games, use all four! 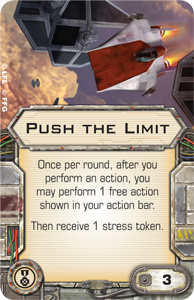 With the large number of green moves and actions on its action bar, I suspect Push the Limit will be a popular upgrade, as well as Advanced Sensors, which will let you boost before performing a Segnor's Loop . 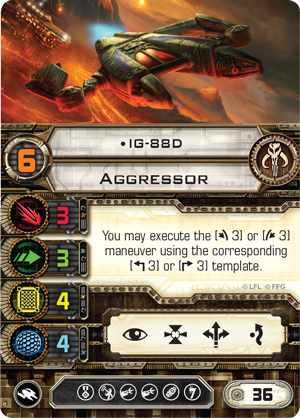 Your style of play varies wildly depending which two Aggressors you bring: IG-88A and IG-88B are more offensively oriented, while IG-88C and IG-88D are more defensive. However, with all the points you’ll be spending on these ships, you can’t fit much else. 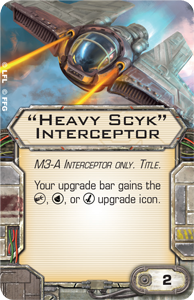 I suspect that the faction’s Y-wings and HWK-290s will be used as support, when you don’t feel like filling your anchor list with more Z-95 Headhunters or cannon-toting M3-A interceptors. Both offer excellent options, but aren’t quite powerful enough to “star” as the sole anchor of a list. 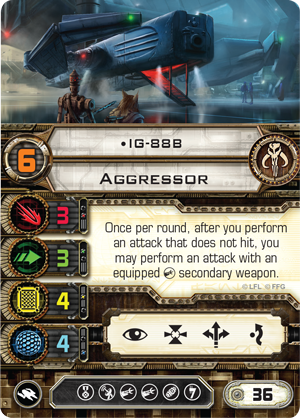 Both ships perform excellently with Engine Upgrades and a turret, to dodge arcs and fire unanswered with the shorter range turrets that they carry. 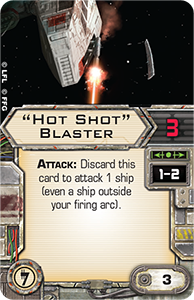 Take Kavil with an Autoblaster Turret , Engine Upgrade, Push the Limit, and Unhinged Astromech as an example. 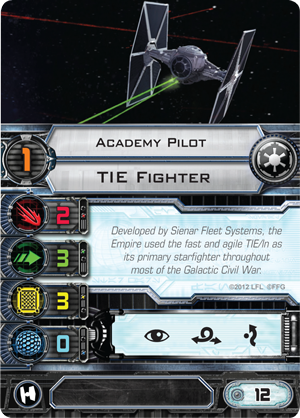 He flies like a TIE interceptor, and can generally roll three attack dice whose hits can’t be cancelled. He doesn’t cost much either; you can still pair him with a Mandalorian Mercenary with Gunner and two Black Sun Soldiers . 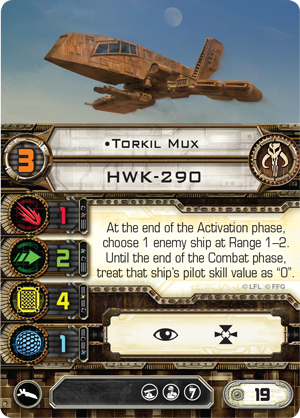 If you want to shoot elite targets down more easily, Torkhil Mux is worth consideration. 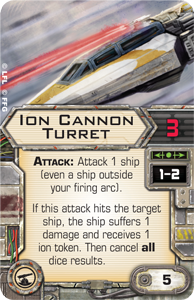 With an Ion Cannon Turret , Intelligence Agent , and an Engine Upgrade, he can get into range and weaken his target enough for a Predator -equipped Firespray-31 to finish it off. 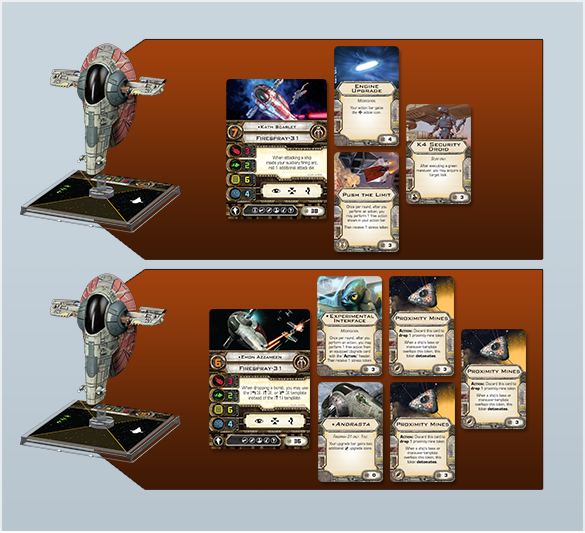 So that’s what I suspect we’ll see in the Wave VI metagame: the few changes to the pillars of Rebel and Imperial play will spur some of the less popular ships to new life, and the Scum faction will favor the use of one or two anchors, plus a handful of small ships. 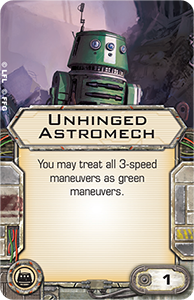 However, this still leaves a lot of room for variety, and I suspect the games you play against Scum players will be vastly different, based on the pilots and upgrades they choose! 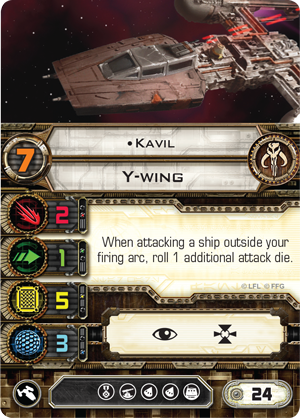 X-Wing Wave VI arrives at retailers late next week. 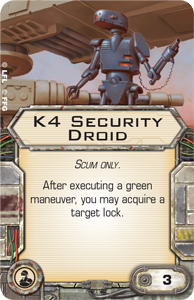 What will your Scum squadrons look like? Will you run a single “anchor” ship? 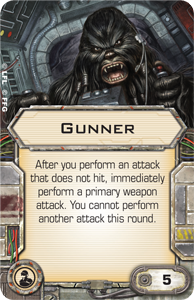 Will you run dual Aggressors? Do you have a completely different list in mind? 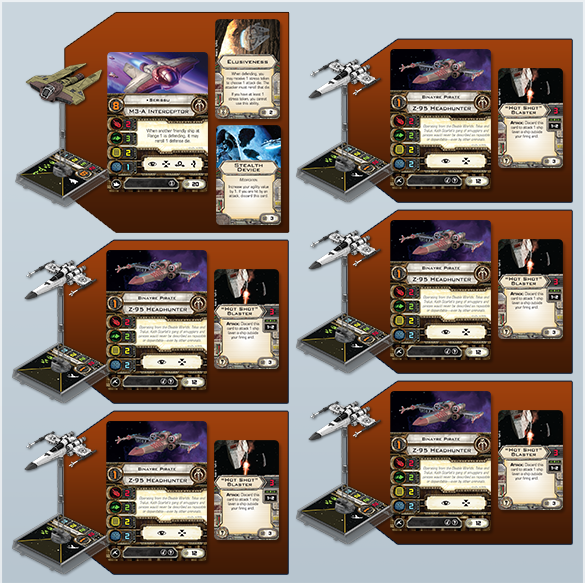 As you wait for Wave VI to hit your favorite local retailer, head over to our community forums, and share your builds with the rest of our X-Wing community!